Sulky, Cynical 'Murderbot' Is One Of Sci-Fi's Most Human Characters In All Systems Red, Martha Wells hides a delicate, nuanced, character-driven story under a veneer of robot fights and space murder — and the titular Murderbot is the character doing the driving. I picked up All Systems Red on a Wednesday morning, meaning to read for five minutes, maybe ten. I'd picked it because there was a mean-looking robot on the cover and, obviously, I have a weakness for robot stories. Also, because it had the word "Murderbot" right there under the picture. All Systems Red: The Murderbot Diaries. And I was thinking to myself, "Well, hey. If someone is brave enough to put the word Murderbot right there on the cover — so unafraid of the schlock connotations, so willing to be lumped into the shallow end of the sci-fi trope pool — then I'm gonna have a look." Weird thing happened next: The book, somehow, glued itself to my hand. It was short, sure, but it was also ... compulsive. Novellas, when done well, are like the oversized appetizer of the literary world — like a giant plate of chicken wings or some little fried things with crab. They're fun, They're fast and they offer simple, easily digestible pleasures. And Red plays that game. There's one Murderbot, some things for Murderbot to murder, and a neat, clean little mystery. The story itself is simple to the point of nonexistence. There are these scientists on one side of an alien planet. On the other side, different scientists. Something goes terribly wrong for the second group, and it is up to the first (plus Murderbot) to figure out what happened before the terrible thing happens to them, too. And that's really it. There's a company (called "The Company," no lie) that provides all the equipment for the scientists. There's a tiny little bit of political worldbuilding, some brief technical jargon-swapping and some explosions. Because everyone likes explosions. But this book is sneaky. As much as you want to think this is just some lightweight little confection made of robot fights and space murder — and as much as All Systems Red wants to present itself as nothing but robot fights and space murder — Martha Wells did something really clever. She hid a delicate, nuanced and deeply, grumpily human story inside these pulp trappings, by making her murderous robot story primarily character-driven. And the character doing the driving? Murderbot is a SecUnit — a partly-organic, mostly-robotic security guard of unspecified gender, owned by The Company and leased out as a mandatory part of any service package bought by anyone wanting to go out and explore the many worlds in Wells's universe. But Murderbot is special, because it has disabled the governor built into its programming that requires it to obey the orders of The Company and whoever is leasing it. It has essentially given itself free will. I could have become a mass murderer after I hacked my governor module, but then I realized I could access the combined feed of entertainment channels carried on the company satellites. It had been well over 35,000 hours or so since then, with still not much murdering, but probably, I don't know, a little under 35,000 hours of movies, serials, books, plays and music consumed. As a heartless killing machine, I was a terrible failure. The complication is, no one can know that it has done this. Therefore, it must continue to act like a robot with an intact governor in order to pass for ... well, what passes for normal, I guess. For a cyborg killing machine. It is hard to say exactly why I like Murderbot so much. Maybe it's the sarcasm that Wells has given it. The dry humor. Its binge-watching habit. There's a Gen X cynicism to Murderbot that I adore — this sense that it has seen it all before, that none of it is very interesting compared to what's on TV, and that everything is going to end badly anyway. It keeps wanting to give up, to die, but then doesn't. It trudges on, like Marvin from the Hitchhiker's Guide but with guns built into its arms. Mostly, Murderbot just wants to be left alone. It's moving to ride around in the head of something that is so strong and so vulnerable, so murder-y and so frightened, all at the same time. There are subtexts to be read into Murderbot — that its experience is a coming-out narrative, that it mirrors the lives of trans people, immigrants, those on the autism spectrum or anyone else who feels the need to hide some essential part of themselves from a population that either threatens or can't possibly understand them. Or both. And I get all of that because every one of those reads is right. Best news of all? All Systems Red is only the first of four Murderbot Diaries novellas. 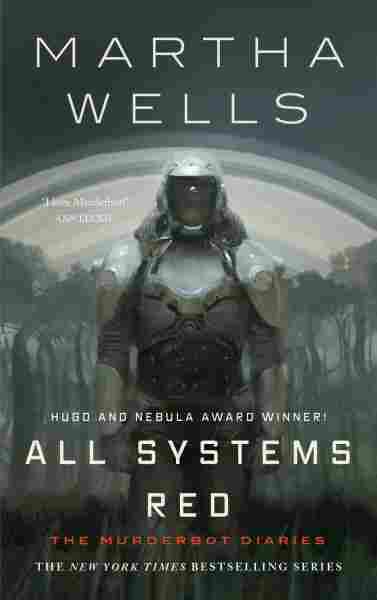 Wells followed Red with Artificial Condition, Rogue Protocol and Exit Strategy, all of which have gotten multiple electronic, hard- and softcover releases over the past year or so, with the Red hardcover being released this month after winning Hugo, Nebula, Alex and Locus Awards in 2018. Which is proof, I suppose, that I'm not alone in my love for Murderbot. That we are all a little bit Murderbot. That we see ourselves in its skin. And that reading about this sulky, soap-opera-loving cyborg killing machine might be one of the most human experiences you can have in sci-fi right now.